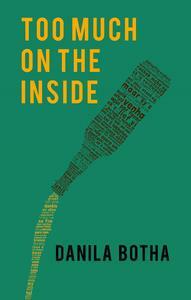 Danila Botha on the books that inspired her to write about life in the city in her new novel, Too Much on the Inside. When I first started writing my novel, Too Much on the Inside, I knew that I wanted to write about four people who were new to Toronto. I was born in South Africa, and had also lived in Israel, and was inspired by the social realities of both. I also had a lot of Brazilian friends from my time teaching English as a second language, and knew that I wanted to write about their experiences. At the time I started writing, I was living in Halifax, a beautiful city, and a city later described in the novel by Lukas, the character from Nova Scotia, but I was homesick for the multiculturalism, vibrancy, energy and endless possibilities that existed in my adopted hometown. I focused on the characters at first, then quickly realized, as I was writing descriptions of Toronto—from Queen Street to St Clair to Bathurst and Lawrence—that Toronto was becoming the novel’s fifth character. I knew I had to read and reread some of my favourite novels and short stories collections set in Toronto (and in Montreal and Nova Scotia) for more inspiration. Here are some of my favourites. I first heard about this collection when David came to speak to my class at Humber School for Writers, years ago. There is something incredibly comforting and exciting about reading a book set in area that you know intimately. Natasha, a sensitive and brilliantly funny series of linked stories about the newly immigrated Russian Jewish family, the Bermans, is set entirely on Bathurst between Finch and Steeles. I went to high school in that neighborhood, and had many friends who grew up there. It was the first time I’d ever seen the buildings on Cedarcroft (which he describes as "reeking of borscht in the hallways") or Goldfinch, or Sunnybrook Plaza immortalized in print. As a Jewish immigrant, I was moved by the emotion and feeling of dislocation he was able to convey in his descriptions of "brown apartment buildings and aging strip malls." As a writer, I was dazzled by his ability to make the suburban beautiful: "I stressed our personal connection to each mundane thing, hoping in some way to justify its inclusion" (from "The Second Strongest Man"). Like Natasha, Where We Have to Go is set at Bathurst and Wilson in North York, even closer to where I grew up, at Bathurst and Glencairn. The book is the poignant coming-of-age story of Lucy Bloom over a seven year period starting in her early teens. Lucy wades through with social situations, deals with parental expectations and an eating disorder with incredible authenticity. Just as the voice of her protaganist has a freshness and vibrancy, Kirshner imbues even the most suburban of settings with electricity and immediacy. Where We Had to Go had me from its very first page, where Lucy has a dream about riding a bike in the discount grocery store No Frills. Later, it perfectly describes the intersection flanked by Brooklyn Furniture, which as she noted, has not changed its window display in about twenty years. It also references the strange (and very real) Isadora’s Wigs and Electrolysis, and the Sea Hi Dragon Chinese restaurant across the street from Neptune Drive. Seeing these landmarks of my adolescence on the page was huge for me: it made me decide to place my character, Nicki, a recent immigrant from Israel at her cousin’s house on Glengrove Ave, the very first street I lived on when my family moved to Toronto. Where We Have to Go is full of other great and precisely described Toronto references, including Zellers and the Galleria Mall. This debut collection of short stories is amazing. My favourite is "Chilly Girl,"a subversive and sweet urban fairy tale that describes the cold, mordern condo buildings in downtown Toronto (whose floors "gleamed like an ice rink") with startling accuracy. "Linh Lai", a story about a Vietnamese high school student working as a waitress at a restaurant called Pho-Mi 99 is another highlight. The descriptions of the Toronto restaurant are so sensory, you’ll feel like you can smell the "cloud of lemongrass, tomato, starchy batter and hot oil" and taste the "Pho clear as glass, [and] creamy white congee lumpy with egg and mushrooms." The story manages to celebrate the multiculturalism Toronto is famous for, and to critique the self-congratulatory approach that is sometimes taken along with it. The restaurant is run by a Canadian man who assigns Linh a new name, Xing, that is neither Vietnamese or Canadian, a No Name, as she notes. There are Vietnamese letters that spell out the words "Beautiful Mrs Duck Soup" in the window. The empathy for Linh Lai always comes through, particularly in her struggle to understand full sentences, adopt new slang and try out new things, including skateboarding. Zoe Whittall is one of my favorite writers, and Holding Still For As Long as Possible is the unique and unforgettable story of a trio of characters alongside perfect descriptions of downtown Toronto. There are a lot of loving references to Queen Street, from the high rise buildings on Jameson Street, in Parkdale—where Josh, a transgender paramedic has to enter—to Trinity Bellwoods Park, The Beaver Café, and a character’s apartment which is referred to as “The Parkdale Gem.” There are sharp and hilarious references to Queen Street gentrification—one of the characters has a friend who is a multimedia artist who makes pins that say "Blame the Drake." I also loved the cross-city references, from Ciao Eddie on College Street, to the dorms at U of T to the self-help bookstore on Harbord Street. A pivotal scene in which the character, Billy, is involved in accident is made even more evocative and real with descriptions of her biking from Kensington Avenue to Dundas and Ossington. I love this book so much that I recently discovered that I have not one, but three copies of it in my bookshelf. I love so many things about it: the way Gibb describes the British immigrant experience, the unflinching, heart piercing honesty of her protagonist Thelma, and the almost magic-realist transference excercises with her therapist. Because of the incredible economy of language, there are carefully placed references to all things Toronto, from Mac’s Milk to the Eaton Centre, The Bay, Le Chateau, Big Bop, and Sneaky Dee’s. Magnified World is the story of twenty-three-year-old Maggie, who struggles with blackouts after her mother’s suicide. Maggie lives and works on Queen Street near Trinity Bellwoods Park, and the book beautifully features many aspects of the neighborhood, from Queen Video to the streetcars, which she describes as clinking "in a baritone of metal complaints." There is some wonderfully rendered magic realism, including a powerful scene on the roof of the Royal York hotel that inextricably connects the heightened emotions with the setting. I love absolutely everything about this book, from each of its characters (particularly Nouschka and Nicholas Tremblay) to its observations about life, love and politics, to its incredible descriptions of Montreal. (It’s another book I have multiple copies of, and I have read more times than I can remember.) One of my favourite motifs is the cats. Cats appear everywhere, brilliantly described, and full of personality. There’s a cat called Alphonse, who is described as being "skinny like a nineteen year old boy wearing a wife beater undershirt. It was walking tentatively as if the floor was hot." Later, another cat is described as looking "like a sweater that had dried on a coat hanger and was now stretched beyond all recognition." Israel is also a country that is full of cats (they leap out from underneath cars and materialize out of thin air as you walk down the street or sit down to eat in an outdoor restaurant). These descriptions were immensely helpful in recalling Ra’anana, the small city that my character Nicki is originally from in Israel. In stark, precise language, Cockroach connects the isolation and depression of a recent immigrant to the desire to literally disappear into the bitter cold winter of Montreal. “How did I end up in a constantly shivering carcass? Walking in a frozen frozen city with wet cotton falling on me all the time.” From the evocative descriptions of his job as a bus boy in an Iranian restaurant, to his descriptions of the neighborhood, streets and drains, each line crackles with a heady mix of suffering and self awareness. This was invaluable to me as I wrote the character of Lukas for my novel—a person with a criminal past who feels so disconnected from his environment, and so guilty about his past that he too could conceive of himself as being part insect. This fantastic collection has some of the best descriptions of small town Nova Scotia, from drinking tiny bottles of Crown Royal in the back of a car on the way to the Cabot Trail, to skating rinks and bible classes. It also has incredible dialogue, and a dark, wonderful sense of humour that imbues the book with a genuine love of its surroundings.